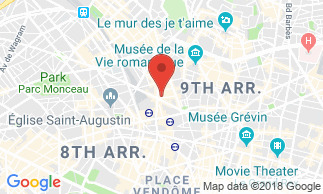 The hotel ATN is a 3-star hotel, located close to the railway station Saint Lazare and department stores ( Printemps, Galerie Lafayette...). The 36 double and twin rooms have been renovated in August 2007. ATN hotel offers 36 rooms on 5 floors. All rooms are equipped with private bathroom with shower and/or bath, hairdryer, safe, minibar and satellite TV. The rooms are also equipped with air condition and free WIFI. The hotel ATN is situated in the 9th district of Paris, close to the Madeleine church and the Opera Garnier. Buffet breakfast not included : 13 € per person. City tax not included : 1.88 € per day and per person.